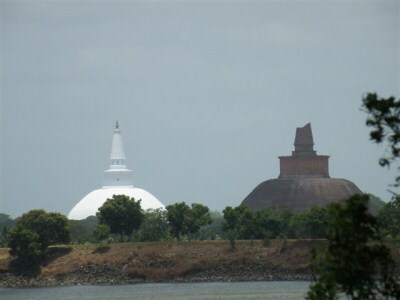 Next day morning we start our journey & went to Anuradhapura. On the way we went to Awkana Raja Maha Viharaya. Around 3.00 p.m we reached to Anuradhapura. We started our journey around 7.30 a.m & first visit to Sri Maha Bodhi & Ruwanweliseya. After that we went to other important places until 11.30 a.m. After that we went to Thisa Wewa & having good time in water. After having our lunch we had a little nap under the roadside tree. Around 3.00 p.m we started our journey again. 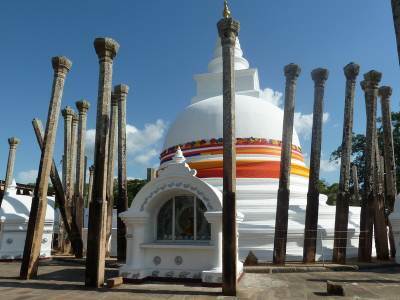 I had a booking of 3 nights at Anuradhapura for a different purpose but it was suddenly cancelled. Since all plans has been made to be out of Colombo, we decided to make a best of it and take a long vacation especially for kids. Since most of the places visited are common, this report will be more of a photo journey with little text. We Started around 6 in the morning and took the Kurunegala Dambulla cut and had breakfast we had prepared on the way. Reached Anuradhapura around 10 am and went and fulfilled the vow first. Afterwards spent time till 12 pm going around the sacred city and visited atamasthana and other sites of interest. It was very refreshing to see these historical marvels again. We took pride in seeing Ruwanweliseya, Thuparamaya, Lovamahapaya, Abayagiriya, Jethawanaya, Samadhi Pilimaya Moonstone etc.